often prices react to that point by falling or shooting through "worm holes"
4/21/2006 12:59:02 PM Mountain Ben:: +5 gotta go out - hope you get +9 Al. Thanks for the CTME course - it got me into this trade. 4/21/2006 9:57:35 AM Mountain Balanced:: Plus 2.5 on the day. I know chaos follows dullness but this is chop city. 4/21/2006 9:19:49 AM Mountain Balanced:: A two point range of 19.50 to 21.50 - 3 times in a row in the last hour. 4/21/2006 9:07:38 AM Mountain Balanced:: Very choppy. Masses can't take direction. Rotational. 4/21/2006 9:05:00 AM Mountain Balanced:: Trying too push higher. Ejected at 19.50 reject at 20 even. Plus .5. 4/21/2006 8:58:40 AM Mountain Balanced:: Good wick on 3 minute. Market rejection. Could go now but seems to be supporting 19 area. Short 20.50. 4/21/2006 8:44:00 AM Mountain Balanced:: Good cross over. Market appears choppy. Plus 1.5 for the day and waiting for clearer direction. 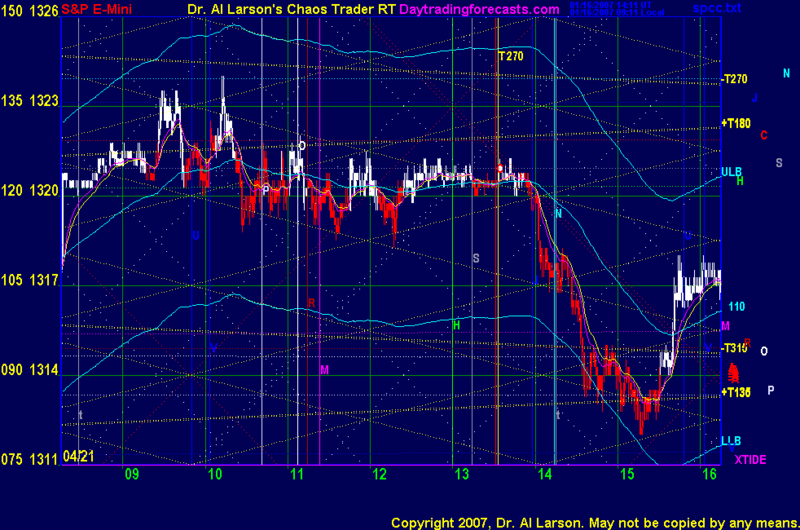 4/21/2006 8:36:22 AM Mountain Balanced:: The 9:30 trade to go with flow was good again for 2 to 3 points.